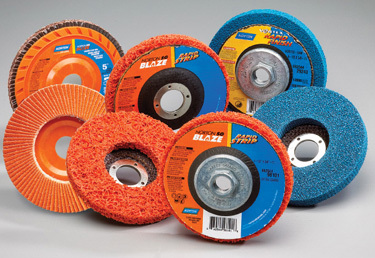 Norton, Worcester, MA, will exhibit new abrasives products for right-angle grinding at its booth, which will feature four main displays, three of which will be product towers and one that will feature live demonstrations. The information tower will featuring flap discs will highlight the new Quick Trim backing, providing a new flexible, easily trimmed plastic back plate that allows full use of the flaps to reduce material and labor costs. Also on display will be Norton's new non-woven right-angle discs, BlueFire advanced zirconia wheels, and much more.